Macgregor 26, new to me this year. It's been on my lot 10 days now since pulling it out of the water. I was in there today and the cushions from the forward berth are moist. There is an access panel in the flimsy ceiling that seems to be leaking water. One of the screw heads had water in the hole. Above this is a cleat and a few anchor points, the bow pulpit, and forestay plate. In the stern those cushions are also wet. There's water along the fiberglass rim of that ceiling. Above that is a traveler that I suspect is allowing water in. I'm afraid several of the hardware pieces were not installed properly and are allowing water in. Do I remove everything that I can and redo the holes and reattach? I'm betting the factory installed hardware is not the cause of the leak. Some of it could be the cockpit drain tube I guess. I'm planning to replace a few cam cleats and rope clutches anyway. 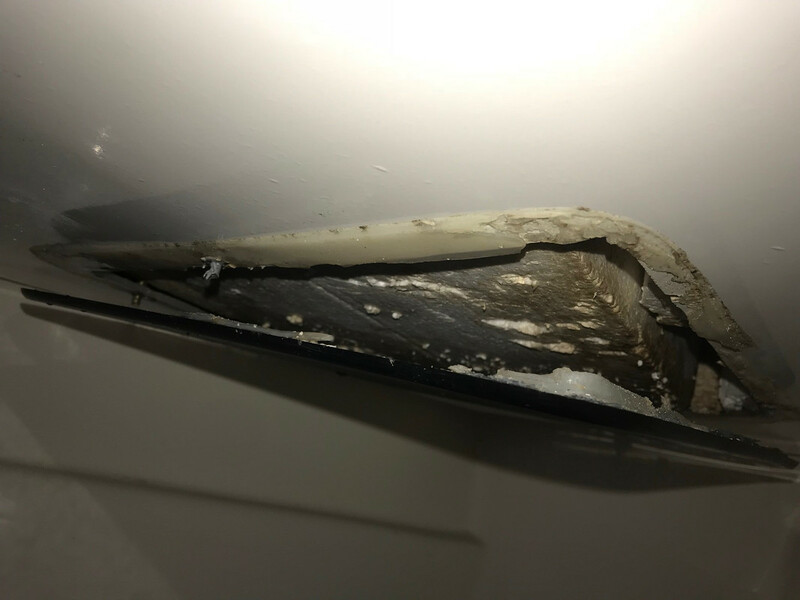 Here's a pic of a screw from the traveler, a pic of the amount of water after about 10 days, and a pic of the foreward access panel. I'm guessing for the panel I need to scrape all that silicone off and redo screws. Several of them don't bite into anything. It's always a good idea to re-bed any and all hardware when you have a deck leak. 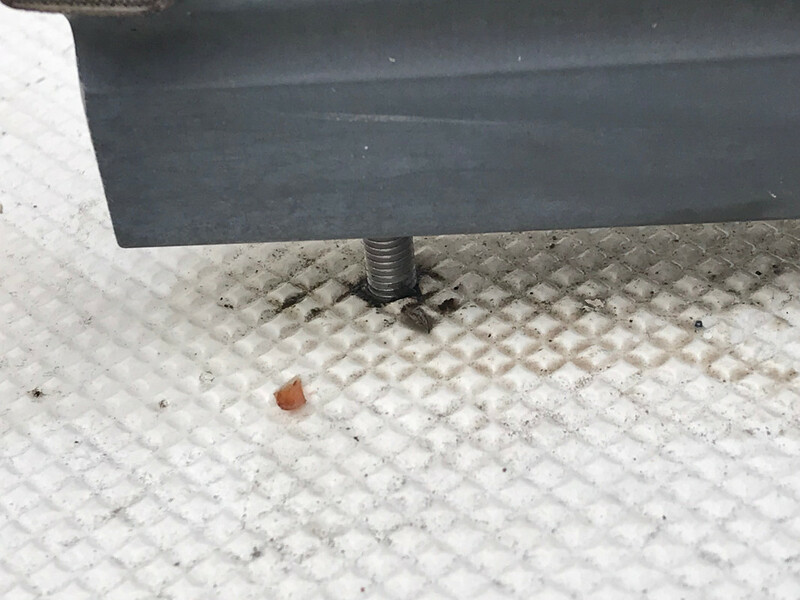 A bolt should never go through the deck like that. There is no way to bed it. There should be a block of wood (or something) between the traveler and deck that the bolt passes through. This allows you to bed it. I wouldn't just limit yourself to the deck hardware. 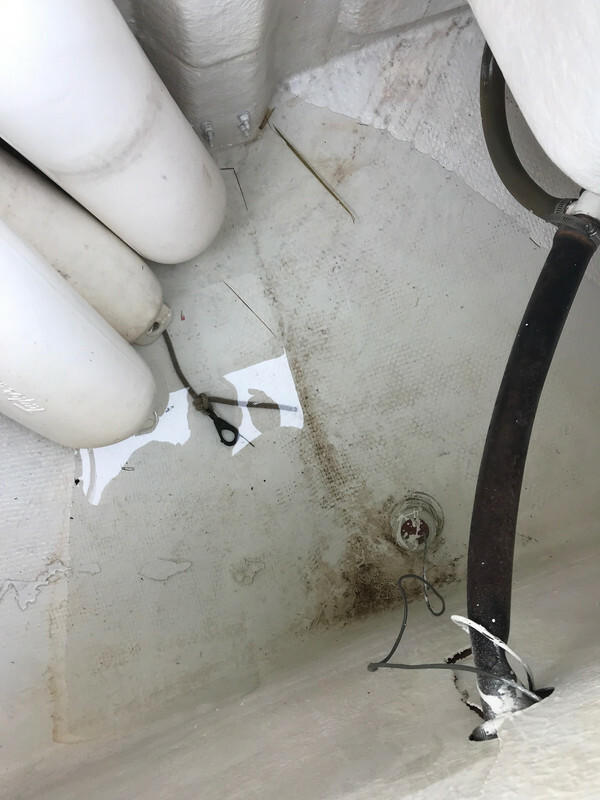 On my MacGregor 26 the knot meter sensor retainer (plastic) cracked in half and the knot meter dropped out underway flooding the boat. The knot meter doesn’t work well so I should check that too. Thanks. The boat was dry after I parked it and this looks like fresh rainwater. I checked the cockpit drain, did not leak. I forgot to check the engine compartment drain. These plates are not sealed anymore, that’s a problem right? If it doesn't look right it probably is not right. Nothing on your whole boat should let water in, unless it was designed to do so. 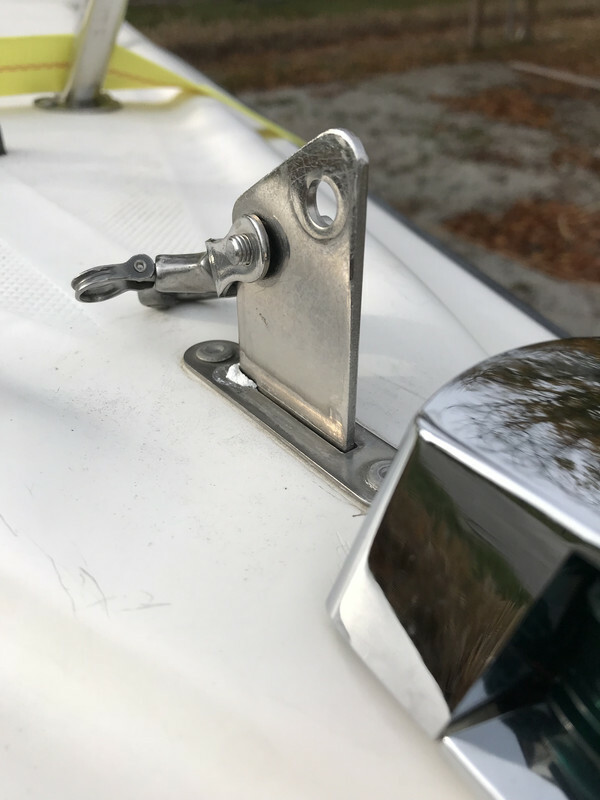 I've been methodically rebedding every single piece of hardware on my '78 Bristol 29.9 with butyl tape from and in line with the instructions from Compass Marine. Excellent results. Lots of work but we are getting drier and drier with each little project. Butyl tape is great stuff. I use it or Dolfinite. I have never used anything out of a tube for bedding and never will. Yes, that traveler needs to be correctly installed, and it will want fender washers, when reassembled, as well as being mounted on timber. I've no idea what your cushions are made of, but, if wet inside, they need to be stored, vertically to drain and dry, until the leaks have been addressed. I'm afraid several of the hardware pieces were not installed properly and are allowing water in. Do I remove everything that I can and redo the holes and reattach? Yes. I'm betting the factory installed hardware is not the cause of the leak. Some of it could be the cockpit drain tube I guess. Usually, water leaves subtle tracks, and you can see where it is coming from. Hardest to find are leaks behind cabinetry and from hull to deck joints, ime. There are some threads about finding leak sources here on CF, try using the CF Custom Google Search function, under the Search menu. I'm planning to replace a few cam cleats and rope clutches anyway. CF Member MaineSail has written about the joys of butyl tape. We've not used it, ourselves. You can make an inner frame and bond it (epoxy) to the fiberglass, after cleaning up the fiberglass, for the screws to go into. You'll want to run a bead of butyl (if you go that way) or Sikaflex, or LifeCaulk when you re-install the access plate. So, good luck with it. You're on the steep part of the learning curve. Kinda sad about the leaks but glad I brought it home so I could find them and fix them. Long answer: What is that tang used for? If it's a chainplate, with the metal extending underneath and bolted into a bulkhead, you could drill the rivets, remove and rebed the whole thing, and replace the rivets with thru bolts or even screws, as the plate doesn't take a load. Yes, those are chain plates. I may try to fill the holes with epoxy and then screw it in. That is why I bought this boat, something I can screw around with and learn how to do things the right way. If I make something worse, not a huge deal. I agree. A MacGregor 26 can't get much worse. Haha, you funny. We should hang out. I’ll park my boat in front of your house. Lowes/ Home Depot sells a nice size/ but powerful 120v squirrel cage blower that is perfect for finding all sources of leaks. - Plug in fan and from outside go around all fittings, screws, ports, hatches, hull to deck joints, mast to deck... you get the idea with spray/ squirt bottle of very soapy water mix. You’ll see bubbles at leak spots were the pressurized cabin pressure air is seeping out via the input of the leak point. Mark with painters tape/ take a pix. Works for me... Good Luck. Thanks, I had seen the fan idea but needed some motivation I guess. I will need to use some painters plastic drape on some of the larger areas. Hopefully it doesn’t just blast it off.